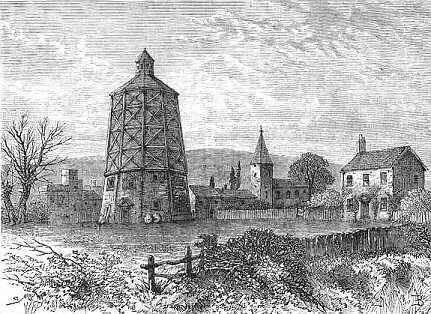 Battersea was first mentioned in 693AD as Batrices Ege and belonged to the Abbess of Barking. The name means Badric’s Island, the original site being surrounded by water or marshland. The old village was centred on Battersea Square and the area was mainly dedicated to market gardening, supplying the city of London with carrots, melons, lavender and asparagus. Industries slowly developed from the late 17th century. These included a pottery, copper works, a lime kiln, chemical works, docks, wharves and windmills. The area was briefly noted for Theodore Janssen’s Battersea Enamels, which utilised transfer printing on porcelain. In 1801 the population was about 3,000, but Battersea saw a rapid expansion of industries (mainly in the north of the borough) and a housing boom (mainly in the south of the borough) with the opening of the London and Southampton Railway in 1838, with its terminus and engine yards at Nine Elms. The line was extended to Waterloo in 1848 and the station at Nine Elms was closed to the public but the railway yards remained for a long time. Various new factories were built, including Price’s Candle Factory, Morgan Crucible Company, Garton Hill’s Glucose Works and the Nine Elms Gas Works, so by 1901 the population had grown to 167,000. The area was badly bombed during the war and the yards were replaced by the New Covent Garden Market in 1960.